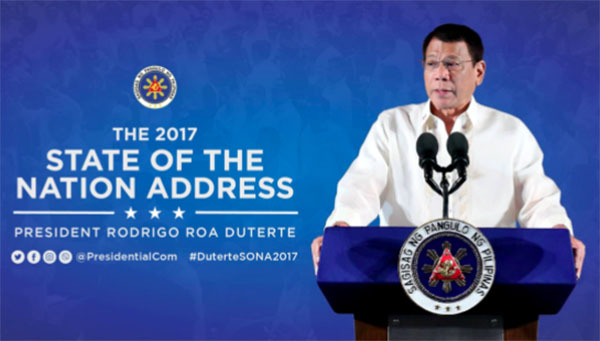 President Rodrigo Roa Duterte delivered his second state of the nation address (SONA) at around 4:30 PM on Monday, July 24, 2017 but the traditional ceremony already started at around 3:30 PM. The President was able to tackle almost all the primary topics and issues concerning Filipinos on his SONA. The speech of Pres. Rody Duterte was drafted in English but there are some instances when Pres. Duterte did not follow the script and showcased his impressive skills and abilities on speaking even without the need of telemprompter. President Rody Duterte's speech during his second SONA centered with the theme "A Comfortable Life for All," the speech resonates better with more Filipinos as the theme is categorized by the administration's three key agenda -- prosperity for all, law and order, and peace -- which categorize the positive changes felt by ordinary citizens.